It is 2007 and Austria is in the grip of a sinister epidemic: Indigo Syndrome. Children are the carriers, and anyone who comes near them is afflicted with severe headaches, nausea, and vertigo. These Indigo children are sent away to the Helianau Institute in Styria, in the mountainous heart of the country, a protected zone where they cannot affect the wider population. There, one of the teachers, Clemens Setz, witnesses students being taken away in strange masks. They never come back. When Setz tries to find out what is going on, he swiftly loses his job, but he doesn't give up trying to uncover Helianau's dark secrets. 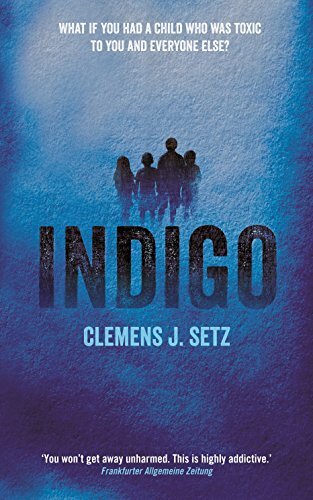 Fourteen years later, in 2021, former Indigo child Robert Tatzel notices an article in the newspaper about his old teacher: Clemens Setz has just been acquitted in a brutal murder trial. But Tatzel harbours resentments against Setz from his days at Helianau, and decides to investigate. Set in a world uncannily familiar and yet entirely strange, Indigo is part thrilling detective story, part post-modern puzzle. Clemens J. Setz has written a novel that will change the way we read novels, and change the way we look at the world.